The official weigh-in for Saturday’s unified IBF/WBA/IBO Heavyweight world championship fight between undefeated IBF world champion Anthony Joshua and former two-time Heavyweight world champion Wladimir Klitschko took place earlier today in London, England. The official weights for the entire card are as follows. Main Event: IBF/WBA/IBO Heavyweight world championship * - 12Rds. Anthony Joshua (IBF champion) 250lbs. vs. Wladimir Klitschko (Challenger) 240 1/4lbs. Scott Quigg 125 1/2lbs. vs. Viorel Simion 125 1/4lbs. Darleys Perez 136 1/2lbs. vs. Luke Campbell 134 1/2lbs. Vacant WBA International Women’s Lightweight championship – 10Rds. Nina Meinke 132 1/2lbs. vs. Katie Taylor 134lbs. Lawrence Okolie 200 1/4lbs. vs. Russ Henshaw 198 1/4lbs. Joe Cordina 134 1/4lbs. vs. Sergei Vib 130lbs. In the United States, the bout can be seen live on Showtime beginning at 4:15 PM ET/1:15 PM PT and will also be available on the Showtime and Showtime Anytime apps. For more information about Showtime, Showtime Sports, the Showtime and Showtime Anytime apps and a list of compatible devices please visit: www.sho.com. HBO will also be broadcasting the fight on a tape delay basis later that evening beginning at 11 PM ET/PT. For more information on HBO, HBO Sports, and HBO Boxing, please visit: www.hbo.com and www.hbo.com/boxing. In the last decade, there has been one constant who sat atop Boxing's Heavyweight division as the division's central figure. Longtime Heavyweight world champion Wladimir Klitschko. Klitschko, a two-time world champion began his second reign as a world champion in April 2006 with a knockout over longtime champion Chris Byrd in their second encounter, ruled over the division for nine years compiling eighteen successful title defenses, and successfully unifying the IBF, WBO, IBO, and WBA Heavyweight world championships along the way. What made Klitschko’s second reign as a world champion so dominant was few opponents were able to put up a significant challenge to Klitschko, who would win the majority of his fights with a basic, but effective weapon, the left jab followed by a straight right hand. With the one-two combination combined with his 6’6 frame and technical Boxing style, the question that was often asked prior to a Wladimir Klitschko title defense usually centered on whether the challenger would be able to negate Klitschko's height, reach, and his ability to dominate a fight with the one-two combination. Although Wladimir as well as his brother Vitali, who himself had three separate and successful reigns as a Heavyweight world champion in his own right, have been labeled as “Boring” to watch by some due to their technical styles, both fighters will go down as two of the most dominant fighters in the history of not just the Heavyweight division, but of the entire sport. Wladimir’s second reign as champion was also the third longest championship reign in Heavyweight history in terms of successful title defenses behind Larry Holmes and Joe Louis. The reign, which as time went on was called a march towards history by this observer came to an end when Klitschko lost his unified crown to undefeated number one contender Tyson Fury in November 2015. In what was an extremely tactical fight that was fought at a slow pace Fury, a fighter who had a height and reach advantage, a rarity for most Klitschko opponents, was consistently able to force the combat and simply out landed Klitschko to earn a twelve round unanimous decision to take the crown from Klitschko. Following the loss of his championship, Klitschko invoked his right to an immediate rematch with Fury. Due to a plethora of circumstances however, the anticipated rematch between the two did not take place. It was due to those circumstances that ultimately resulted in Fury opting to relinquish the unified Heavyweight world championship and in the process send the Heavyweight division into a state of limbo with several of the championships that comprised of the unified crown being vacated and in some circumstances, new champions determined between each respective organization’s top contenders. After undefeated contender Charles Martin won the vacant International Boxing Federation (IBF) crown in January 2016 with a stoppage of Vyacheslav Glazkov, Martin defended his newly won world championship against undefeated “Knockout Artist “ Anthony Joshua in April of last year. Joshua would score a convincing second round knockout of Martin to win the championship. Joshua, the 2012 Olympic Super-Heavyweight gold medalist entered that fight unbeaten as a professional with all fifteen of his wins coming by way of knockout. Although the subject of at what stage in a fighter’s career will that fighter be ready to challenge for a world championship is one that will likely stir some debate, Joshua has shown following his knockout of Martin in two defenses of the IBF world championship that he was not only ready for the challenge, but after two dominant knockout wins over challengers Dominic Breazeale and Eric Molina that he is a player in the discussion as to who is the best Heavyweight in the division currently. Joshua’s win over Molina in December of last year, set up a collision with the former longtime kingpin of the division Wladimir Klitschko in an encounter that will take place on Saturday night at Wembley Stadium in London, England. In addition to Joshua’s IBF world championship, the vacant World Boxing Association (WBA) and International Boxing Organization (IBO) world championships will also be at stake per Klitschko being owed a mandatory challenge of both championships from his contractually obligated rematch with Tyson Fury, which never occurred. The political elements of the sport aside, this fight is a classic battle of youth versus experience. A young world champion whom some feel has not been tested thus far in his career against a former longtime champion looking to become part of only a handful of fighters to have won a version of the World Heavyweight championship on three separate occasions. The questions that I have as this fight approaches all center around the former champion Wladimir Klitschko. Although there is no disputing his dominance prior to losing his championship to Tyson Fury, it is important to remember that a casualty of the rematch with Fury falling through in addition to throwing the division into a state of limbo for a period of time is that Klitschko has also been inactive since he lost his championship to Fury in November 2015. It is certainly understandable how one could question if potential ring rust might be an issue for Klitschko given not only the length of time he has been out of the ring, but also given that Klitschko is forty-one years old. In addition to the subject of ring rust, Klitschko must also answer the question of whether his performance against Tyson Fury, where he was never really able to get into a consistent offensive rhythm was a case of having a bad night at the office under circumstances where he was facing a fighter who was taller than himself and was also at a disadvantage in terms of reach for a rare time in his career, or if his sporadic offense was a sign of possible decline. It is logical to assume both given Klitschko's inactivity and the champion’s reputation for scoring quick knockouts as he has only been stretched as far as seven rounds twice in his career thus far that Joshua will look to test Klitschko early in the fight. An element to also consider is that both fighters will be equal in height at 6’6 and nearly equal in terms of reach as the champion will only have a one inch advantage at 82” to Klitschko's 81”. The approach that I envision Klitschko taking in this fight is one where he might look use his experience to extend Joshua into the middle and late rounds while gradually stepping up his offense as the bout progresses. Klitschko is known for having a tactical Boxing style, but he is also a fighter whom in his sixty-eight fight professional career, has scored knockouts of fifty-three of his opponents registering a career knockout percentage of 78%. It would also be logical to see the challenger look to use the twenty-seven year old Joshua’s aggression against him by looking to make him miss and counter the champion as he comes forward in an attempt to set up a possible knockout as the fight progresses. One element that surrounds this fight to also consider is it will take place in the legendary Wembley Stadium where an estimated crowd of 90,000 spectators are expected to be on hand. Although sometimes estimated attendance figures do not match or exceed expectations prior to a marquee Boxing event, the crowd that will be in attendance will be massive and one might question how the young champion will respond to what is the definition of “The Big Fight” atmosphere. Klitschko, who has regularly fought in front of sold out arenas and stadiums throughout his career will likely not be awed by the occasion, but for Joshua, who has fought in front of sold out arenas, the question of whether he could freeze in front of a crowd of the size expected at Wembley Stadium for this fight is a fair one to ask and one that will likely be answered early in the fight. In terms of the business aspects of the sport the Joshua-Klitschko bout will make history in the United States as for the first time two of the sport's major television players and longtime rivals Showtime and HBO will each produce separate broadcasts of the fight on the same day due to each network having exclusive deals with the fighters involved. Showtime, who has a deal as the U.S. Broadcaster for Anthony Joshua's fights, will broadcast the fight live, while HBO, who has a similar deal as the U.S. Broadcaster for Wladimir Klitschko’s bouts, will air their broadcast later in the same evening. Although the networks are certainly no strangers to each other as they famously co-produced two of Boxing's biggest pay-per-view events the Lennox Lewis-Mike Tyson bout in 2002 and most recently the Floyd Mayweather-Manny Pacquiao bout in 2015, this particular situation is unique and it is refreshing to see that a compromise was made where both networks would be involved rather than one network stepping aside or worse both networks electing not to televise the encounter in any form, something that has been an ongoing issue with regard to the lack of U.S. television coverage of a good majority Boxing's international scene for years. We will have to wait and see if the unique circumstances that have Showtime and HBO doing separate broadcasts of the same event is something that is a one-off or something that could lead to more of Boxing's international scene being showcased to American audiences on a regular basis. For now, this observer feels this is a step in the right direction that is long overdue. Whether or not the actual fight lives up to the anticipation and magnitude of the event remains to be seen. Boxing history however, is full of stories of longtime champions who have lost their crowns attempting to reclaim their status against a young world champion who represents a new generation/era of a division and/or the sport. Will this fight signal a return to the top for a fighter who was considered the best Heavyweight in the world following a loss of his crown and lengthy absence, or will this encounter signal a true changing of the guard to a young unbeaten “Knockout Artist”, who may ultimately prove to be the face of a new era of the Heavyweight division? We will get the answer on Saturday night. Update: We would also like to inform readers that the scheduled post-fight material for the recent Andre Berto-Shawn Porter and Oscar Valdez-Miguel Marriaga bouts will be included in the April 2017 edition of the monthly feature Observations On Recent Events In Boxing which is scheduled for release during the first week of May. We apologize for the delay. Stay tuned. Which Card Will You Be Watching: Berto-Porter Or Valdez-Marriaga? On Saturday, April 22nd, the Boxing world will be treated to two intriguing bouts in Boxing's Welterweight and Featherweight divisions. In a battle of former world champions, former two-time Welterweight world champion Andre Berto will square off against former IBF Welterweight world champion Shawn Porter at the Barclays Center in Brooklyn, NY in a bout that will headline the latest edition of the Premier Boxing Champions series broadcast by Showtime in the United States. This encounter brings together two of the Welterweight division’s most exciting fighters because both have crowd-pleasing styles. In one corner will stand Andre Berto a former two-time world Welterweight champion, who at one point in his career was considered by some to be one of if not the best fighter in the Welterweight division as well as a player in the sport's pound for pound debates. Despite two reigns as world champion, an argument could be made that Berto is perhaps best known more for the fights he has lost than for the status he's earned as a former world champion. A reason one could point to when making that argument is that Berto has taken part in several Fight of the Year candidates throughout his career in bouts he did not always get a victory. Of course, one of those fights that most remember was Berto’s thrilling first encounter with Victor Ortiz in April 2011 for the WBC Welterweight world championship. A back and forth war that saw both fighters suffer knockdowns where Ortiz earned a hard fought twelve round unanimous decision to hand Berto the first loss of his career and end his first reign as a Welterweight world champion in a fight that was named by several media outlets including Ring Magazine as the 2011 Fight of the Year. After a brief second reign as Welterweight world champion after defeating IBF world champion Jan Zaveck in September 2011, Berto would again come out on the short end of a grueling battle against former three-division world champion Robert Guerrero in November 2012 and suffer a stoppage loss at the hands of Jesus Soto Karass in July 2013. Since the loss to Soto Karass, Berto has gone on to win three of his last four fights including a fourth round knockout of Victor Ortiz in their rematch in April of last year. The lone loss in Berto's last four fights came in a twelve round unanimous decision against future Hall of Famer Floyd Mayweather in September 2015. After thirty-five professional bouts and engaging in some of the more grueling battles in the sport in recent years, one might question what the thirty-three year old Berto has left. Standing across the ring from Berto on Saturday night will be former IBF Welterweight world champion Shawn Porter. Porter, a winner of twenty-six of twenty-nine professional fights will come into this fight off of a hard fought twelve round unanimous decision loss to current WBA/WBC Welterweight world champion Keith Thurman in June of last year. Much like Berto, Porter has a good mix of hand speed, punching power, and is an offensive-minded fighter. As is the case with Berto, Porter has faced adversity in his career in addition to his most recent outing against Keith Thurman. Some might remember Porter’s title defense against Kell Brook in August 2014. In what was a close and competitive fight where both fighters suffered cuts and were each able to have periods of effectiveness throughout, Porter, who was then the IBF world champion in the Welterweight division, suffered the first loss of his career in losing the championship to Brook via twelve round majority decision. Despite that loss to Brook and his loss against Thurman, Porter remains a top contender for any world champion in the division as he looks to get back in the win column in this fight against Berto. What interests me whenever there is a bout between two offense-first fighters is to see how each will approach the fight. Both fighters have the ability to get an opponent out of there should the opportunity arise and each has shown the ability to take a punch and keep fighting. Normally what I tend to look for in regard to a fight like this is to see if one fighter will choose to make a tactical adjustment by allowing their opponent to get their offense off first while looking to create openings for counter punches to set up their own offense. This fight, which is an elimination bout to determine a mandatory challenger in the World Boxing Council’s (WBC) Welterweight ratings, might come down to who takes that initiative by looking to play the role of counter puncher. Although as longtime readers know this observer is not one who likes making predictions, I would be surprised if this bout does not turn into the entertaining fight it appears to be on paper. It is one might argue a classic crossroads scenario between two fighters who each have something to prove. The second main event that will take place on Saturday night will feature a battle for the World Boxing Organization (WBO) Featherweight world championship as undefeated world champion Oscar Valdez will attempt to make the second defense of his crown against current WBO number one Featherweight contender Miguel Marriaga at the StubHub Center in Carson, CA. Valdez-Marriaga will headline a pay-per-view card in the United States. This encounter much like the Berto-Porter pits two offensive-minded fighters against each other. The champion Valdez will enter the fight unbeaten in twenty-one professional fights having scored knockouts in nineteen of those bouts registering a career knockout percentage of 90%. In his last fight in November of last year, Valdez scored a dominant seventh round stoppage of Hiroshi Osawa. Valdez has only been as far as ten rounds once in his career and has scored the majority of his knockouts within seven rounds. This suggests that the champion could look to take advantage of any opening that might be available to him in this fight with the intention of ending the encounter early. Valdez will likely find an opponent who is more than willing to engage in the form of former world title challenger Miguel Marriaga. Marriaga, a veteran of twenty-six professional fights will be making his second attempt at a world championship. The challenger has won twenty-five of those twenty-six bouts scoring knockouts in twenty-one of those fights registering a career knockout percentages of 81%. In his lone defeat, Marriaga lost a twelve round unanimous decision to former World Boxing Association (WBA) Featherweight world champion Nicholas Walters in June 2015 in his previous attempt at a world championship. Since the loss to Walters, Marriaga has won five straight fights, scoring knockouts in three of those bouts, and also won the North American Boxing Organization (NABO) Featherweight championship along the way. It will be interesting to see whether Marriaga, who has more experience than the champion in terms of professional fights fought and a significant edge in terms of total rounds fought of 126 to 87, will look to extend the champion into the middle and late rounds of this fight where the champion has not been extended much in his career. Despite Marriaga having a high career knockout percentage, he will be best served in the eyes of this observer if he can find a way to neutralize the champion’s power and pressure and attempt to outbox Valdez. What is also interesting about these two fights is they will be going head to head against each other on television with Berto-Porter airing on Showtime and Valdez-Marriaga airing on cable/satellite pay-per-view. Although there are several elements with regard to the “Business of Boxing “ that should be considered whenever a head to head scenario takes place, one may question the wisdom of putting a pay-per-view card against an established series that has consistently produced competitive fights as well as high ratings. When one also takes into account that Valdez-Marriaga will be available to the public for a price of $54.95 for the High Definition feed of the card as well as the fact that the Saul Alvarez-Julio Cesar Chavez Jr. pay-per-view card on May 6th is expected to produce solid pay-per-view returns in terms of total buys, despite being at a higher price of $69.95 for the High Definition feed one may wonder if this will prove to be a wise move by choosing to put this card on pay-per-view rather than perhaps a different network. In an era where the preferences of television consumption are heading in the direction of Over The Top (OTT digital distribution over traditional cable or satellite television along with ever increasing pay-per-view prices, despite a consistent trend of pay-per-view Boxing events underperforming expected returns in terms of overall buys/revenue, the question of whether a card should be presented on pay-per-view over a cable/satellite network or Over The Air (OTA) broadcast networks is one that will become an increasing issue as time goes on for promoters as well as networks throughout the entire sport on a global scale, who have yet to test the waters of OTT digital distribution, will have to consider. This however, will not diminish what could be a candidate for Fight of the Year candidate when Valdez and Marriaga square off on Saturday night. Although both Valdez-Marriaga and Berto-Porter look to be exciting fights, it will be interesting to see if the ultimate authority, the Boxing fan will opt to watch one card over the other or if a good portion of the viewing audience will choose to watch both events. There is one thing for certain regardless of what one's opinion might be regarding the concept of head to head Boxing cards on television and/or the concept of “Pay-Per-View” as a focal point of the sport’s biggest attractions, interest in the sport of Boxing remains high and in a year that has already seen some memorable battles, this observer believes both of these encounters will soon be on the list of great fights of 2017. We'll see what happens on Saturday night. PBC: Berto vs. Porter takes place tomorrow night (Saturday, April 22nd) at the Barclays Center in Brooklyn, NY. The fight can be seen in the United States on Showtime beginning at 9PM ET/6PM PT and will also be available on the Showtime and Showtime Anytime apps. Check you local listings for time and channel in your area. For more information about the Premier Boxing Champions series please visit: www.premierboxingchampions.com. For more information about Showtime, Showtime Sports, and the Showtime and Showtime Anytime apps please visit: www.sho.com. Check your listings internationally. Valdez vs. Marriaga takes place tomorrow night (Saturday, April 22nd) at the StubHub Center in Carson, CA. The card can be seen in the United States on cable/satellite pay-per-view on Top Rank Pay-Per-View for $54.95 HD/$44.95 SD. The pay-per-view broadcast, which will also be available on a pay-per-view basis online on www.toprank.tv will begin at 9PM ET/6PM PT. contact your cable/satellite provider for ordering information. Check your listings internationally. For more information about Valdez vs. Marriaga and Top Rank Inc. please visit: www.toprank.com. Follow Beau Denison on Twitter: www.twitter.coom/Beau_Denison. The weekend of April 15th featured some interesting bouts featuring rising prospects looking to advance to the next level of their respective careers as well as two world champions meeting in a highly anticipated Jr. Welterweight unification bout. One of the prospects who saw action was undefeated Light-Heavyweight contender Dmitry Bivol, who squared off with veteran Samuel Clarkson on April 14th in the main event of the latest edition of Showtime Sports’ popular ShoBox: The New Generation series at MGM National Harbor in Oxon Hill, MD. One of the questions that I always keep in mind when seeing a rising prospect is how that fighter will respond to the exposure that comes with being featured as a focal point on television. An obvious question that usually accompanies the question of how the fighter will deal with the exposure that comes with being featured on television is will the fighter be given a significant test as he looks to continue his progress toward contender status. For Bivol, one could say he is a fighter who has already made the transition from prospect to Light-Heavyweight contender, despite only having nine professional fights prior to meeting Clarkson. Clarkson meanwhile entered the bout having won nineteen professional fights against three losses and came into the encounter riding a nine fight winning streak. What appeared on paper as a fight that could present a test for Bivol simply did not prove to be the case as the undefeated Bivol quickly scored a knockdown of Clarkson in the first round with a right hand to the head. To his credit, Clarkson was able to get to his feet before being dropped for a second time with another right hand. At this stage in the fight, I thought it was only a matter of time before the bout would be stopped. Although Clarkson showed his mettle by getting up from two knockdowns, it was apparent in this observer's eyes that he could not find a way to keep Bivol, who was very impressive in how he implemented a systematic attack, off of him. Clarkson however, was able to survive the round and the fight continued. Bivol was able to keep Clarkson largely on the defensive and consistently backed him up due largely to the success he was able to have in placing his punches and using his right hand as the focal point of his offense. In round four it would be a counter right hand to the chin from Bivol that would drop Clarkson for a third and final time by Referee Harvey Dock who stopped the bout as a hurt Clarkson staggered to his feet. The victory for Bivol, his tenth career victory, also allowed him to maintain his position as one of two fighters with interim/regular champion status in the World Boxing Association (WBA) Light-Heavyweight ratings, a designation he earned in June of last year with a twelve round unanimous decision over Felix Valera in Moscow, Russia. Even though some might argue that a fighter with only ten fights being in a position that Bivol currently finds himself in regard to the WBA’s Light-Heavyweight rankings might be an indication that a fighter is being moved along too quickly, it is important to note that Bivol was a decorated amateur with a 268-15 record. An argument could and perhaps should be made that much as was the case with two-division world champion Vasyl Lomachenko, who is 8-1, with 6 Knockouts as a professional, sometimes a fighter can be considerably more seasoned due to their amateur pedigree than the length of that fighter's professional record would suggest. Although Lomachenko was able to win his first professional world championship in his third pro fight and was able to become a two-division world champion in under ten fights, Lomachenko has proven thus far to be a rarity in the sport . Bivol has shown thus far to be highly skilled and as a professional has successfully met and cleared every obstacle that has come his way. Even though, it is certainly not my intention to compare Bivol and Lomachenko, it is clear that Bivol is a force to be reckoned with in the Light-Heavyweight division. With a record of 10-0, with 8 Knockouts off of his stoppage of Samuel Clarkson, if Bivol continues to win, and more specifically turn in the kind of performances that he did against Clarkson, it will only a matter of when and not if Bivol will challenge for a world championship. The undercard Bivol-Clarkson featured two encounters between undefeated fighters in Boxing's Jr. Featherweight and Welterweight divisions. In the 122lb. Jr. Featherweight division, undefeated Glenn Dezurn scored a hard fought eight round unanimous decision over Leroy Davila to advance his record to 9-0, with. This was a competitive fight from start to finish where both fighters were able to have periods of effectiveness. Dezurn’s sharper offense and accuracy is what gave him the upper hand in this bout, in this observer's opinion. Davila, who fell to a record of 5-1, with 3 Knockouts, was able to push Dezurn throughout the fight, but was ineffective in his aggression and that is what allowed Dezurn to get the better of the action in my eyes. The fight however, will likely benefit both fighters in terms of their overall development and it would not surprise me to see a return encounter between the two down the line. In the Welterweight division, rising prospect Malik Hawkins scored second round knockout over Carlos Soto. Hawkins was credited with a knockdown in round one when Soto, who’s left eye was severely swollen from Hawkins’ right hands took a knee. After suffering significant punishment in round two, the condition of Soto’s eye prompted the fight to be stopped prior to the start of round three. Although Hawkins dominated this fight and did what he had to do in earning his eleventh career victory, he simply did not face much resistance from Soto who took the bout on short notice. It will be interesting to see who Hawkins fights next as he looks to continue his climb up the Welterweight division. The impressive performance by Hawkins will also likely open further opportunities for him to be showcased on television and it is possible that Hawkins progress will be seen on future ShoBox cards. On April 15th the Boxing world turned its attention to the Hydro Arena in Glasgow, Scotland as WBA Jr. Welterweight world champion Ricky Burns met undefeated unified International Boxing Federation (IBF) and International Boxing Organization (IBO) world champion Julius Indongo in a bout to further unify the 140lb. Jr. Welterweight division in the main event of a card that was televised on AWE: A Wealth of Entertainment in the United States. Despite being undefeated in twenty-one previous bouts heading into his encounter with Burns, Indongo was considered an underdog by some against the more experienced three-division world champion. It was Indongo however, who would validate his status as a unified world champion prior to the fight as he used his reach and combination punching to keeping Burns at distance. What impressed me about Indongo’s performance was not only how well he was able to control the tempo of the fight, but specifically how he used angles with both his lateral movement as well as in the way he threw and placed his punches. It was this approach that kept Burns from being able to execute his offense effectively and was made to miss frequently. What was perhaps the most impressive thing about Indongo's performance was he was able to gradually take the pro-Burns crowd, in Burns’s home country of Scotland out of the fight. Burns’ inability to consistently close distance and only being able to land sporadically with his offense was simply the story of this fight. Although some might say that this bout lacked the excitement normally associated with a world championship unification fight at the highest level of the sport, a Boxing purist can appreciate the type of performance that Indongo put forth in this bout. A performance that allowed Indongo to earn a twelve round unanimous decision to add the WBA Jr. Welterweight world championship to his unified crown. Even though some may question whether or not the loss to Indongo could signal the end of an illustrious career for the former three-division champion Ricky Burns, this observer believes that in this instance it was not eroding skills, which usually is a sign of a fighter on the decline, but rather the craftiness and speed of Indongo that was responsible for Burns’ ineffectiveness in this fight. Sometimes it is as simple as one fighter besting the other. Boxing history is full of stories of great fighters who at one time or another had a bad outing against a highly skilled fighter who might have been underestimated by some fans and experts before a fight takes place. It will be what Burns does coming out of this fight which may determine if this loss was a signal of a fighter in decline or a case of a great fighter having a bad night against a fighter who might also be regarded one day as a great fighter by fans and experts alike. Although I look forward to sharing further thoughts regarding all of the fighters who fought on these two cards in the near future, the outcomes of these bouts, specifically the two main events have certainly created some interesting possibilities in regard to fights which could be made and will likely stir up discussion, opinions, and debate among Boxing fans as well as experts. Let the discussions begin. The year 2017 has already provided some interesting moments in the sport of Boxing. A consistent theme thus far has been competitive fights that end in closely scored decisions. This theme seemed to begin in this observer’s eyes with the February 18th Welterweight encounter between former multi-division world champion Adrien Broner and Adrian Granados. A grueling encounter where two fighters simply put it on the line and left it all in the ring where there was not much to separate the two fighters at the conclusion of the bout. The end result, a ten round split decision in favor of Adrien Broner had the ingredients of what most associate with a close decision. More often than not, the main ingredient is an encounter that evolves into a great fight where there is a difference of opinion as to who got the upper hand. The month of March featured a couple of notable encounters that one might argue belong in the same category as Broner-Granados in terms of being highly competitive with a healthy difference of opinion as to who won those battles. 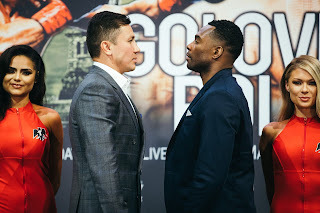 Of course, the most obvious of the encounters most would say was the March 18th world Middleweight championship fight between long-reigning unbeaten champion and knockout artist Gennady Golovkin and longtime top contender Daniel Jacobs. Before briefly sharing my thoughts as to what I feel might be in store for both Golovkin and Jacobs in a mini continuation of this observer’s coverage of that fight that was published on March 26th, there were other encounters that I feel deserve attention. One such encounter took place on March 11th in Germany when former WBO Jr. Middleweight world champion Demetrius Andrade met WBA number one contender Jack Culcay in a bout to determine interim/regular championship status in the World Boxing Association’s (WBA) Jr. Middleweight ratings. This was a tactical chess match from start to finish. What made this fight difficult to score in my estimation was both fighters were able to have periods of effectiveness in several of the rounds and the ebb and flow of the fight seemed to change constantly. One fighter tended to get the upper hand in the first part of a round only for the other to take control during the latter stages of a round. Of course, when it comes to the definition of “Swing Rounds” there often is a healthy difference of opinion as to who got the upper hand, but in my eyes this fight was extremely close and I ended up with a 115-113 or seven rounds to five scorecard in favor of Jack Culcay at the end of the twelve round bout. It seemed to me that Andrade was able to get the better of the action in the first half of the fight even though many of the rounds throughout the entire bout were close and Andrade narrowly avoiding a knockdown in the fourth round after the legs of the two fighters became tangled resulting in the former WBO world champion going down to the canvas in what was correctly ruled a slip by Referee Luis Pabon. What made this fight challenging to score in my eyes was Andrade seemed to get the better of the action when he was able to control distance and keep Culcay on the outside. Culcay meanwhile seemed most effective when he was able to execute his offense in short spurts of combinations particularly when he was able to get on the inside and exchange with Andrade. Although the official verdict of this encounter was ultimately ruled a split decision in favor of Andrade with two official judges scoring the fight 116-112 in points or eight round to four in his favor, I do not feel that this decision was controversial and I would like to see a rematch between the two at some point in the future. As for when the rematch might take place, with the win Andrade earned interim/regular champion status in the WBA’s Jr. Middleweight rankings which puts him in line to challenge unified WBA/IBO Jr. Middleweight world champion Erislandy Lara. Even though logic would suggest that Andrade would likely face Lara before a potential rematch with Culcay, one must remember that since the WBA instituted interim/regular champion designations in their respective rankings shortly after Bernard Hopkins successfully unified three Middleweight world championships in a unification tournament in 2001, fighters who hold such designations have not always faced the current WBA champion after becoming number one contenders and have in some cases had to fight on and maintain their position in the rankings for significant periods of time before getting their opportunity to face the champion. If Andrade is not in the plans for Erislandy Lara for the remainder of 2017, the possibility certainly exists that Culcay could be an option for him, but I believe that Andrade might look to face another top contender in the event a fight with Lara cannot be made in the near future. Perhaps an opportunity to face current WBC world Jr. Middleweight champion Jermell Charlo or recently crowned IBF world champion Jarrett Hurd might also be available to Andrade if a fight with Lara is not in the immediate future. Of course, one might argue that the best option in the Jr. Middleweight division both from a financial and exposure standpoint would be a fight against current WBO world champion Saul Alvarez, but Alvarez will face Julio Cesar Chavez Jr. on May 6th at a catch-weight of 164lbs., ten pounds above the 154lb. Jr. Middleweight limit and four pounds above the 160lb. Middleweight limit. Obviously, with the Alvarez-Chavez fight looming and depending on the outcome of that fight, there are lucrative options available for Alvarez outside of the Jr. Middleweight division. At minimum, the status of the WBO Jr. Middleweight world championship should be viewed as in limbo until after Alvarez-Chavez takes place. We will simply have to wait and see what options will be available to Andrade going forward and how the landscape of the Jr. Middleweight division will change in time. Perhaps the most competitive fight that took place during the month of March was an encounter that took place on the undercard of Golovkin-Jacobs on March 18th between WBC Jr. Bantamweight world champion Roman Gonzalez and Wisaksil Wangek. In what was a grueling back toe to toe battle, Wangek emerged victorious earning a twelve round majority decision to win the championship from Gonzalez, the fighter considered by many to be the best pound for pound fighter in the world. Although this observer felt Gonzalez won the fight as I scored the bout eight rounds to four or 115-111 in his favor, there were several close rounds in this fight that saw plenty of back and forth action. Gonzalez suffered a knockdown in the first round from a body shot by Wangek. Wangek was also penalized a point in round six as a result of a clash of heads that was ruled to be intentional by Referee Steve Willis. Even though there were several “Swing Rounds” in this fight the key in my eyes might have been how one chose to score round six. Keeping the point deduction in mind, if one felt Wangek were winning the round prior to the point deduction it is logical to assume that a round that would have otherwise been scored 10-9 in favor of Wangek would be scored even 9-9 because of the point deduction. If one felt that Gonzalez was winning round six before the deduction against Wangek however, that round would be scored 10-8, which would negate the 10-8 round Wangek earned in round one because of the knockdown. From my perspective, I scored round six 10-8 in favor of Gonzalez as part of a stretch where he won rounds two through eight on my scorecard before also winning the twelfth and final round. Wangek meanwhile won rounds one, nine, ten, and eleven with the two fighters earning a 10-8 round in rounds one and six resulting in the 115-111 score in favor of Gonzalez on my scorecard. For Wangek, who also goes by the name Srisaket Sor Rungvisai, the win over Gonzalez earned him his second reign as WBC Jr. Bantamweight world champion after previously holding the championship from May 2013 to May 2014. Although some may have questioned the decision which made Wangek a two-time world champion, it was a great fight that like the others being discussed in this column could have gone either way. One prospect who one might argue was put to his first significant test during the month of March was undefeated rising Middleweight prospect Jason Quigley, who earned a hard fought ten round unanimous decision over veteran contender Glen Tapia on March 23rd in Indio, CA. Quigley, who entered the fight with a record of 12-0, with 10 Knockouts started the bout strong, but appeared to have difficulty in the middle rounds as Tapia gradually worked his way into the fight. Even though Tapia was able to make the fight close in this observer’s eyes as the bout progressed as I ended up scoring the fight 96-94 or six rounds to four in favor of Quigley, all three judges turned in wide scores in favor of Quigley earning him the decision victory. It is important to remember that each fighter has their own path as they attempt to climb the ladder of contention and determining when a fighter is ready to challenge for a world championship can be a difficult task for a fighter’s handlers. For now, Leduan Barthelemy could be approaching the point where he might be ready to test the waters to see if he can make the transition from rising prospect to a world title contender. This brings us back to what may be in store for Gennady Golovkin and Daniel Jacobs going forward. In the weeks since the bout took place, I have thought of a few scenarios that might be available to both fighters. One scenario for the champion Golovkin most would say would be to look to defend his world championship against Saul Alvarez assuming that Alvarez is successful in his bout against Julio Cesar Chavez Jr. on May 6th. Even though this option might be the most lucrative on the table for Golovkin, another possibility which could be option to him would be to fully unify the Middleweight division by looking to face Billy Joe Saunders, the undefeated WBO world champion who stands as the lone obstacle between Golovkin and the Undisputed Middleweight championship of the world. What might be interesting however, is if Jacobs might be a potential option for Saunders as it is not uncommon to see a fighter who loses a close decision in a challenge for a world championship receive another opportunity against another world champion in the division. Jacobs did put forth an impressive performance against Golovkin and did create an element of doubt in regard to the outcome of a Gennady Golovkin championship defense and should be considered a viable option for anyone in the Middleweight division. Given the close decision that was rendered in the Golovkin-Jacobs bout, this observer feels the best option available to both fighter as could also be said for Broner-Granados, Culcay-Andrade, Gonzalez-Wangek, and Quigley-Tapia would be for a rematch between the two to take place. Although there was no rematch clause for the Golovkin-Jacobs bout, public interest could fuel demand for a rematch between the two with the storyline of whether or not Golovkin can validate what some might feel was a questionable decision that went in his favor in a would be second encounter with Jacobs, who is more than deserving of a second opportunity against a fighter who has carved out what this observer has called a path of destruction through the Middleweight division. Jacobs not only took Golovkin the full twelve round championship distance for the first time in his career, not only ended Golovkin’s twenty-three fight knockout streak, but also gave the champion what should be viewed as a legitimate scare. This warrants a rematch. 2017 has thus far proven to be an extremely competitive year for the sport of Boxing. We now will see what is in store in April. If the first three months of the year are any indication, April could continue to provide the type of competition and excitement that the sport thrives off of. It should be fun to watch.